Skye is the daughter of Louisa and Arthur Collins, born in Halcyon Mountain. 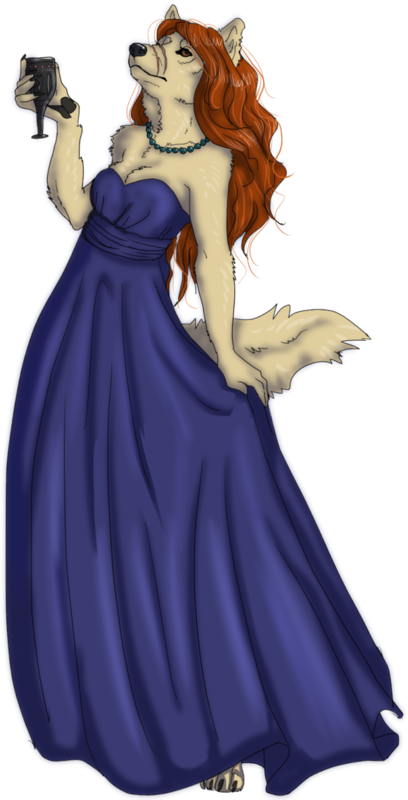 She was previously the leader of Cercatori d'Arte, and was the leader of the pack that proceeded it, Midnight Shores. Skye is also mates with Jazper Rhiannon-Knight, the former leader of Casa di Cavalieri. It is unknown if Skye is alive or dead. With Raw Sienna (#D68455) on her tail tip and bridge of her nose. 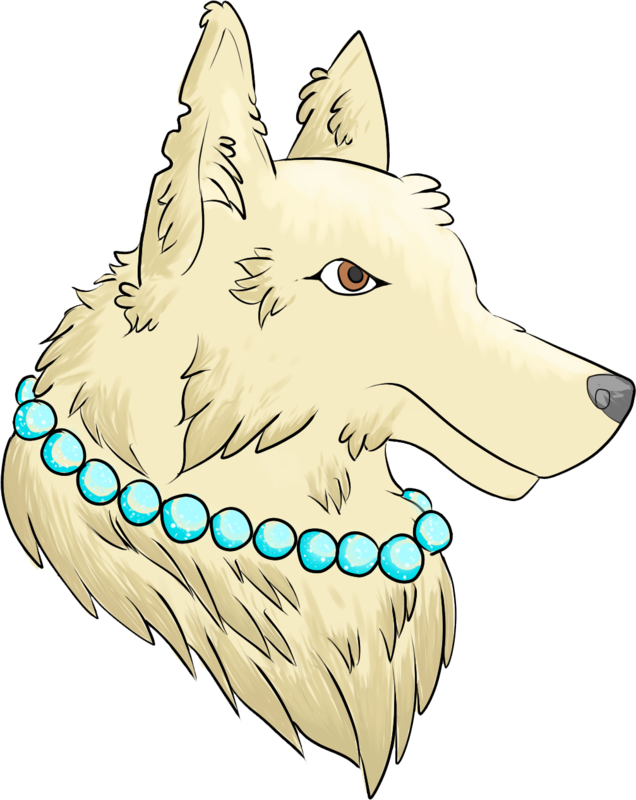 Skye is a perfect blend of her varied heritage, having gained traits from her various wolf ancestors. Her entire body is a light creamy color, save for her tail tip and the bridge of her nose, which are a shade of raw sienna. Her eyes are a deep brown. 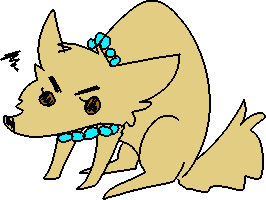 Her appearance is completely wolf - her ears are smaller than those of coyotes and jackals, and her build is stockier and bulkier, although not by much. Her build could be best described as slight in all forms, although she is very lean and has wiry muscles. In Lupus form, she is a bit shorter than average, standing at 26", and slender as well. In this form, as well as her halfling form, the top of her head has a stripe of reddish-orange. 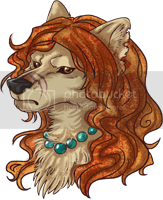 Her fur was once soft and silky, but now is rougher; it's also thick, owing to her mother, who came from the north. In Secui, she does not look much different, save for her fur becoming a bit rougher and scruffier, the nape of her neck growing much more bulk and fur, and her overall appearance of being larger and more feral. In Optime form, Skye is somewhat short, standing at 5' 6", with most of her weight shifted to her feet instead of her thighs. She has long, silky auburn hair that can best be described as wavy; it is thick and comes down to her shoulders. She has a rather feminine, slender figure in this form, although it is clear that she is muscled and well-worked. In all forms, Skye has several scars. She has two scars on the bridge of her nose, as well as various scars on her shoulder and belly from various fights. She has a chunk taken out of her left ear from her fight with Liam. Her tail has also been broken, and has a noticeable kink in it in the middle. Bridge of her nose: two long scars from a fight with Liam. Chunk out of her left ear from the same fight. Shoulder and midsection: various claw- and teeth-marks from various fights. Tail is noticeably bent and crooked from a fight with Whispers Neonite. Only wears her jewelry in diplomatic or trading situations. She maintains a somewhat aloof demeanor punctuated by a quiet confidence; she considers Midnight Shores her first and foremost duty above all else, and also considers them to be better than everyone else, and this can show in her interactions with others. 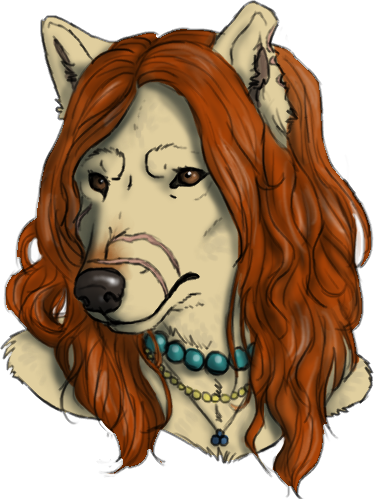 Skye does not have a very strong sense of morals, and can delve into the world of secrecy and manipulation to serve her pack. She can look down upon those who are loyal only to a code of honor, and believes that the strong should survive, as that is how it is in the wild. However, she is also not needlessly cruel, and is not adverse to helping those in need, provided that it does not hinder her pack. She can also be amiable and teasing towards her packmates every once in a while. Usually, however, she is sparse in words and can be irritated extremely easily. She can also come off as haughty or superior at times. This ideology also leaks into her fighting style. Although she is stronger than she looks, she relies on being agile, tricky, and unpredictable in battle. She uses intricate moves almost like a dance to confuse and tire out her opponent; she strikes quickly, and avoids blows. She speaks in a soft, steady, and smooth voice with little inflection and a rather dry tone to it. Packs: Skye believes Midnight Shores to be the best pack. She also likes Casa di Cavalieri, to a degree. Personality: Skye has an extreme dislike of anyone she believes to be weak, self-centered, idiotic, too loud, too quiet, treacherous, dramatic, or, well, most anything. She's not very tolerant. Volume: She speaks in a soft and steady, low voice that usually isn't very loud, but still carries weight and authority with it. Tone: Her tone can be dry and sarcastic a lot of the time, although it can be hard to tell. Personal-Scent: She usually smells very heavily of her pack and the canines in it, and faintly of Jazper Rhiannon-Knight. Jazper Rhiannon-Knight: Skye's mate. Skye loves Jazper, despite their differences and many disagreements. Esmeralda Collins: Skye's daughter and subleader. Skye and Esmeralda are very close, and Skye is extremely proud of her daughter and all that she's done for the pack. Ares Knight: Skye's son and a high-ranking wolf of Midnight Shores. She's very proud of him, and considers him to be a lot like his father. Jace Wolfe: Skye's friend. They have a sturdy relationship and are loyal to each other, although they're not much for casual talk. Elsie Hennamin: Skye is fond of her grandfather, and likes Elsie a lot. She thinks she's a strong point in the pack. Felix Nightlark: Skye's "good for nothing" grandson. Although she acts less than kind to him at times, she's secretly proud. Silvano Sadira: Skye makes it a point to visit his pack and strengthen relations. She likes his company, even if they don't meet often. Kenna Foxleigh: Skye's subleader and friend. Skye appreciates what Kenna does for the pack, and values her loyalty as well as her friendship. Honrin Wolfe-Denahlii: Skye's friend, as well as the father of Azazel Collins. Despite their accidental one night stand, Skye still values Honrin as both a packmember and a friend, although she harbors no romantic feelings towards him. 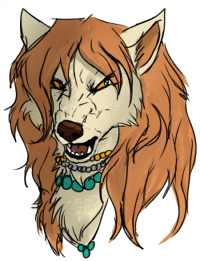 Shawchert Menue: Skye's former leader, who left the pack twice before. Skye has mixed feelings about his abandonment, and has only encountered him once since. Bangle Guffawri: Skye's former mate. He abandoned the pack when Skye was attending the Winter Festival, deeply hurting Skye. Armed Combat (Master): Through years of practice, Skye has gotten extremely adept at fighting with her dagger in a quick and strange style of fighting. Reading & Writing (Master): In her youth, Skye was enamored with reading stories and writing in her journal. She still retains these skills, years later. Trading & Diplomacy (Journeyman): As leader, Skye has had to learn how to interact well with members of other packs, and trade goods between them. She is proficient at it, although she is not immune to blunders. Gardening (Journeyman): Skye is the gardener of the pack, and although she is very good at keeping the plants alive and well, she still has room to improve. 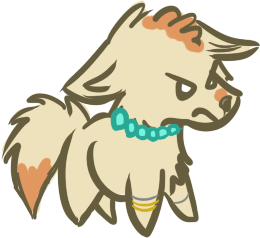 Strength: Skye is small and light, and being female, she doesn't possess a lot of physical strength. She relies on trickery and agility to fight, rather than brute force. Empathizing: Skye doesn't see the point in "too many emotions", and can look down upon those who she deems as 'weak'. She only attempts to empathize with her closest family and friends, if that. Singing: Skye is probably one of the worst singers ever. Personality: Headstrong & energetic. Very wary and jumpy around canines he doesn't know. Description: Jack is tall, lean, and wiry, having been trained to run quickly and sure-footedly. He is white with black spots, and has grown very close to Skye. Please see Skye's History for more information!